where it is crucial to "Get it in writing!" Certain offences may warrant instant dismissal but in most cases Labor Law will require that a employee warning letter be issued first. Typical procedure will be for a first, second, third and final warning to be issued for statutory offences under your applicable labor law or terms of employment contract. Third and final warnings may be issued simultaneously - (verify with your specific labor laws) - after which a disciplinary hearing will be held and a decision made on an employee's status. 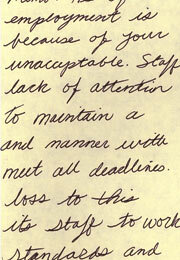 Getting it in writing is most important for the employer's case should a dispute arise. A warning letter may generally be valid for six months and should be kept in the employee's file with a copy given to the employee. Labor Law varies in different states and countries and as such you must ensure that the correct process is being followed when dealing with staff disciplinary issues. Note:For more information on the employment process and other free employment contracts and forms, please refer to our main Employment page. Should the Employee refuse to sign receipt of this Written Warning, the undersigned witnesses shall testify to the fact that the Employee received the warning. It is important to enter as much detail as possible when detailing the offence committed, rather than too little or vague information.